The people have voted … with their taste buds. Nearly 500 people attended the 11th annual Taste of Rhinebeck, a food competition and fundraiser for Northern Dutchess Hospital and the Thompson House. This year, $23,500 was raised to support existing and new healthcare services. Held Tuesday, April 14, 23 culinary venues participated in this festive food crawl by offering samples of gourmet eats, hoping to be the crowd favorite. The fundraising feast was held in the village. This year’s People’s Choice winners: Liberty Public House, main course; Market St., dessert; Tavern at the Beekman Arms, appetizer; and China Rose, beverage. The Chefs’ Choice winners: The Local, main course; Aroi Thai Restaurant, dessert; Tavern at the Beekman Arms, appetizer; and The Shelter, beverage. New this year, Village Pizza of Rhinebeck was chosen to receive the Ira J. Gutner Hospitality Award, named after the late owner of Samuel’s of Rhinebeck. Gutner donated goods to the hospital and many others, and participated in the event. He died on April 4, 2014. The proceeds from ticket sales benefit Northern Dutchess Hospital Foundation, which provides fiscal support to the hospital and The Thompson House nursing facility. This year the event raised $24,500. 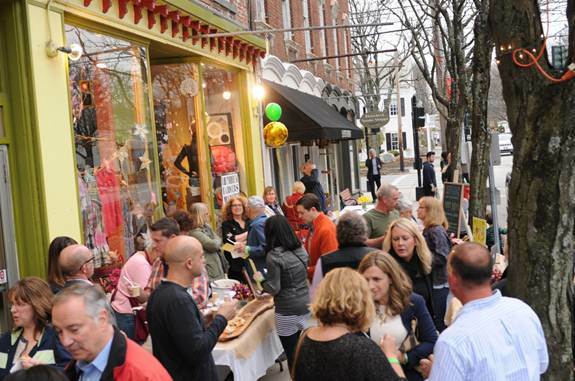 Did you know that all of the participating restaurants and other vendors/venues donate the food, beverages, staff and time for the Taste of Rhinebeck? Copyright 2015-2018. Northern Dutchess Hospital Foundation. All rights reserved.